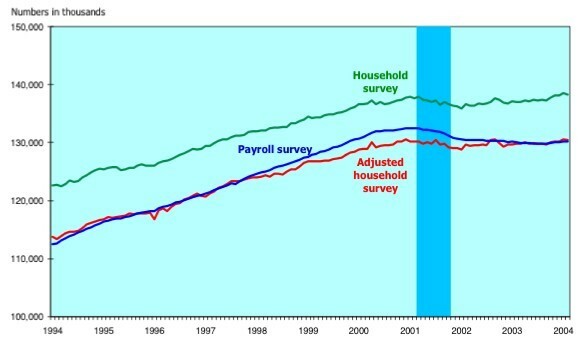 The Bureau of Labor Statistics weighs in on the now thoroughly discredited Payroll vs. Household Survey pseudo-controversy. "As part of its annual review of intercensal population estimates, the U.S. Census Bureau determined that a downward adjustment should be made to the household survey population controls. This adjustment stemmed from revised estimates of net international migration for 2000 through 2003. In keeping with usual practice, the new controls were used in the survey starting with data for January 2004. Estimates for December 2003 and earlier months were not revised to reflect the new (lower) population controls. Federal Reserve Chairman Alan Greenspan has noted that the Payroll survey is much more reliable than the household survey. That hasn't stopped several economists -- some of whom have an explicit political agenda -- from arguing that the divergence between the two surveys is understating the strength of the economy. As if Greenspan didn't resolve the issue in his recent statements, the BLS itself has now weighed in. 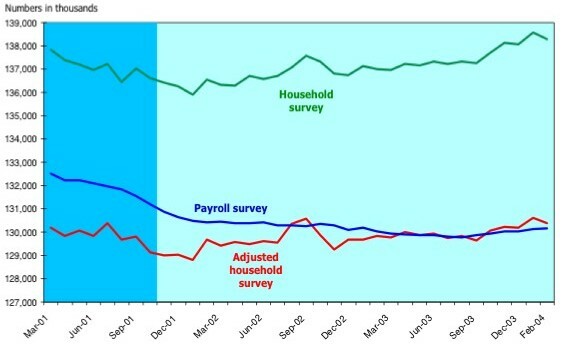 As these following charts make clear, when "modified to make it more "similar in concept and definition" to the payroll survey," the divergement all but disappears. BLS then added back in nonagriculture wage and salary multiple job holders. The BLS notes about both charts (above and below): The household series presented here has been smoothed for population control revisions. The "adjusted" household series has been smoothed for population control revisions and adjusted to an employment concept more similar to the payroll survey. Shaded area indicates recession. The BLS has now formally resolved the Household/Payroll Survey discrepancy. Let's see who has the intellectually honesty to step up to the plate with a big mea culpa. You may assume any of the original advocates of this now totally untenable position who adhere to it are little more than partisan hacks, and disregard them as appropriate. Mad props to Steve Antler for the awesome pick up . . .
could be me, but it stikes me that the most partisan use of the statistics has been by democrats with their "millions of jobs destroyed by Bush" agenda. (As a Brit I have no agenda other than an unbiased reporting of the data.) In fact, even on these revised numbers, the HH survey shows jobs created not destroyed, so it will be interesting to see how they (Krugman et al) respond. Of course this has not been a typical upturm because it wasn't a typical downturn. But that's another story.